I was transfixed, like one of the children at Dunya's knee, spellbound by a maestro storyteller. I would have finished in one sitting had the battery in my kindle not died. It's just one of those books a person is willing to forego sleep over. 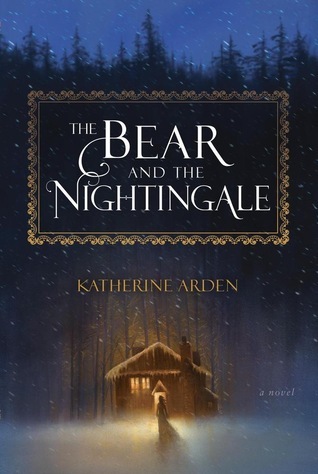 I've never read a Russian fairytale before, let alone one from medieval 'Rus,' but I was blown away by the richness of characters. Many more than the stereotypical acquaintances of my childhood. There's a guardian spirit for absolutely everything ~ hearth, stable, doors, etc., ~ I would run myself ragged remembering to give them all offerings. Their connectivity to forest, land, lake, sky, weather, is vast ~ a tribute to how bound/tied the people were to the earth and all it gave (or took) from them. In a place with winters as long and harsh as Russia experiences, it seems only fitting they would have phenomenal fairytales now that I think about it. They would have plenty of hours to fill during the cold, long, almost full-time darkness of winter days to concoct them. The Frost King was one of my favorites. I think I'm under his spell. I know he said he was "death" but he's so multi-faceted! I'm mesmerized at the extent of his abilities & I want to read more about them, him & his beautiful white mare. He even sounds handsome to me though I doubt I'd feel that way were he to encircle my neck with his long thin fingers! I LOVE that the heroine of the fairytale is a girl. No knights in shining armor saving the day here. The message of courage (and kindness) being valued as much as beauty in a maiden, very refreshing. Vasya had that in spades and was so much more than a "witch" ~ as the village people categorized her. I can't wait to read the next book and watch her grow into her power and her true self, free from the restraints of tradition and family to hold her back. Will Medved become unleashed again & return?? What sort of relationship will develop between Morozko and Vasya?? How will Christianity continue to influence adherence to the "old ways?" Such a lot of reality in a fairytale, isn't there? Who said they were solely escapism?! In my eyes, this is a book that would have universal appeal. Well, unless you are so far gone to cynicism that delight has eclipsed you & your soul is impenetrable to magic. Otherwise, just read it. There will be zero regrets. Bought 5 years ago, a puny little twig of a thing, in the clearance section of the local nursery. Almost removed from the garden because it never bloomed & barely thrived. Suddenly, this year, a bud! What color would it be? A mystery until yesterday. It looks like an Itoh 'Bartzella' peony but it's definitely a tree peony, not an Intersectional, so it can't be. No Matter. It's name will remain a mystery but the bloom is sunny, bright & beautiful. ** spoiler alert ** I could read this kind of book, all day, every day. It's multiple timeline, based in England, lots of beautiful historic ruins, magical artifacts (in this case a spectacular mirror & pearl), a secret Order, an old diary, etc., etc. I literally saw the cover, read the description blurb and said "count me in!" It appears this author has been very prolific in the realm of historical romances & mysteries. Not sure why I've never encountered her since I dabble in the historical romance genre from time to time ~ but this was my first exposure to her writing. I will absolutely be coming back to read her next book, 'The Phantom Tree.' It sounds every bit as intriguing as 'House of Shadows' did. In the modern day timeline story, the protagonist Holly is blessed (cursed??) with the ability to see/experience flashbacks from the past. I've always wished I could experience that sensation but of course, it's never happened. It would probably be a bit freaky and surreal if it did occur, but fascinating once the feeling of being "spooked" passed? 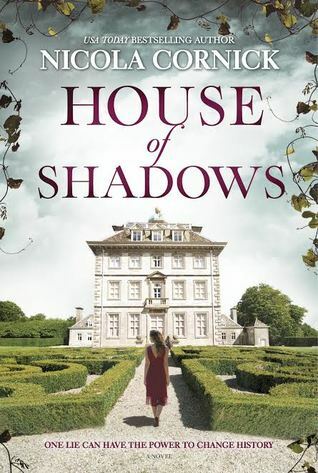 It seemed pretty obvious Holly had a connection to the other timeline stories when she repeatedly saw the long destroyed Ashdown House (as it was before it burnt centuries before ~ square, tall white walls, cupola with gold ball on the top.) Every time she saw it, it sounded so beautiful, I wanted to will it into existence ~ house, gardens and all. The other part of the story that was so fascinating to me (& I've actually had heated discussions with friends on this topic) is the theme of reincarnation. As the 'The White Queen's life comes to an end, she and her lover promise they will find each other in another lifetime. All three timelines are connected by that thread and the premise they are repeating lives until their quest is finished. I interpreted that to mean until they find each other & are able to love each other without impediments, even if that takes centuries to accomplish. The discussions that come up around this topic with friends are usually religion based. Christians don't believe in reincarnation yet it calls to me like a beacon & I find it very appealing that we could get more than one chance to "get it right." Because of that, if it's part of a storyline, all the better. Can a spirit be reborn or is there something recognizable passed down thru DNA?? I love entertaining these ideas and I certainly enjoy reading about them too. Maybe Holly & Mark will be the two that get "it right" and end the cycle?? The feeling that they knew each other seemed pretty powerful, which makes the theory not easily dismissed. As is usually the case in time slip novels, I found the stories in the older time lines more interesting than the present day one. Going back in history & delving into the world of Elizabeth Stuart, 'The White Queen' was terrific. The same feeling applied after being introduced to Lavinia Flyte, a woman brought to life by her vivacious personality and sassy attitude. Perhaps creating a third character with a similar strong resolve was impossible? Something about Holly just didn't "grab" me. I had a hard time liking her and I don't know what that was about? I should have felt a lot of empathy for her considering her life but she seemed a bit too "flaky"? Sleeping with Mark the first time she met him then acting like a schoolgirl for a long time afterwards, didn't seem realistic considering her age? I also would rather have spent more time learning what happened to 'The Order of the Rosy Cross,' or seeing the fabulous 'Sistrin Pearl' in action, etc., instead of visiting with her friend Fran so much or some of the other newer characters. I definitely enjoyed the book overall although it started out stronger than it ended. The author is clearly a skilled storyteller and does a fantastic job setting the mood, being descriptive and engaging the reader. I'm in awe of anyone who can throw in as many components as she did and not leave anything dangling at the end. Happy I picked up this book & discovered a new author. ** spoiler alert ** This book could have been absolute garbage and I would have loved it ~ that's how happy I was to be back in the 'Outlander' orbit. Of course it wasn't absolute garbage, far from it. Diana Gabaldon is way too intelligent of a writer to ever publish anything in that category. What a nonsensical way to start a review. Lord John Grey is one of my favorite periphery characters from the 'Outlander' books. As such, it was like seeing an old friend, the warmth I felt at renewing our acquaintance. My approach to reading his series has been deliberately paced, in slow methodical fashion, so as to draw out my obsession pleasure with this world for as long as possible. 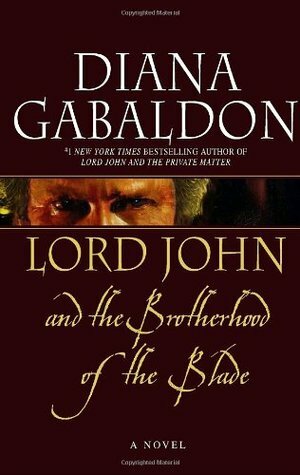 'The Brotherhood of the Blade' mentioned Jamie Fraser as part of the storyline which, of course, was an instant, bonus, no-brainer, decision-maker to reading the book. Sadly, Jamie was actually a very small (tho pivotal) part but it was nonetheless satisfying to read dialog between two of my favorite men in literature. Now, don't count, but how many times have I waxed on and on about what a gentleman LJG is? Probably so many, everyone is doing a perfunctory eye roll at this very minute. Too bad! I'm not quite finished yet nor can I ever imagine a day when that would be so. I could go on and on about it ad nauseum ~ it's so particularly striking in this day where simple civilities are noticeably lacking. He makes me sigh, he's so perfect. How is it fair one man is as blessed in good attributes as he ~ looks, athleticism, manners, intelligence, wealth, noble birth family, etc.?? He's missing nothing except the ability to love openly, the person of his choice. No small thing that. I'm sure he would trade any one of the previous for the opportunity to be granted that freedom. Reading about what happens to sodomites in the British Army is sobering, as there is still much progress to be made in the world on that front. Diana Gabaldon wrote such an honest portrayal of love, lust, betrayal & anguish in the relationship between LJG and Percy Wainwright, I felt I lived it right along with him. It was so typical of LJG to find the best case scenario in how it ended. Of course he would. At the end of this book, it did not appear Percy & Lord John were on bad terms. However; (me being ever the stickler for details) I distinctly remember, when they crossed paths again in 'An Echo in the Bone,' Lord John was not very thrilled to see him. Perhaps in one of the few books I have left to read, they have a distasteful encounter? or is it possible I've forgotten something? hmmmm. The other big storyline was the mystery of who murdered John Grey's father, the Duke of Pardloe and the sleuth work to figure it out. I won't spoil that part, for once! I really enjoyed 'The Brotherhood of the Blade' although my favorite in this series (of the ones I've read) remains 'The Scottish Prisoner.' Mostly because Jamie & LJG comport themselves as equals in that excursion. This book fills in more details on events we 'Outlander' fans have read about in the regular series. We get a lot of insight into the depths of Lord John's feelings for Jamie. I felt pangs of empathy for him all over again that it was destined to be unrequited. Indeed, I could would love to commiserate with him over a brandy. *sigh* If only. The explosive argument between LJG and Jamie regarding homosexuality was very revealing and written to perfection. I'd always wondered if Lord John knew about what happened to Jamie with Black Jack but here was the answer. I was happy to learn it and I think it explained to Lord John, without question, Jamie's reaction to his advance at Ardsmuir. Despite their considerable differences ~ religion, politics, sexuality, etc. ~ they are inexorably drawn to each other in friendship. We could all learn a lot from DG's fictional world. That single sentence sums up the whole of this book. Mr. Brown outlines how every single Indian tribe that once populated this great country (with few omissions) was swindled, cheated, forced or killed into relinquishing their lands. It was hard & heartbreaking to read. That our forefathers were so dishonorable in their intent, their word and their greed is egregious & affronting no matter how much time has elapsed since they occurred. Breaking promise after promise after promise and treaty after treaty after treaty, until the Indians were relegated to small sections of the worst pieces of land the government deemed of little value to white settlers. They lost their lands, their way of life, their culture and became totally dependent upon the United States government for survival. If they were a farming tribe, the land they were "given" had no ability to grow or sustain crops; if they were nomadic, they were confined to a tiny fraction of land, devoid of game or fowl to hunt. How could they pass on ancient traditions to their young, when they had no way of following them themselves? It had to be the most disorienting, frustrating, undignified, infuriating experience anyone could possibly imagine. To all the people who say today that Indians are "unmotivated, drunk or lazy" ~ try stripping yourself of everything you know to be your life plus your dignity to boot & see where you find yourself. There is no atonement for the way they were raped of their way of life and the lands on which to live it. Do I want to give up my property because of it? Selfishly, "no" ~ I have no more interest in giving up what I consider to be "mine" than they did ~ but that doesn't mean I don't see the grave injustices in how we acquired the entire country. Maybe the soldiers and politicians that negotiated these treaties, then reneged on them, justified it to themselves because the Indians couldn't read or write English. That makes them all the more atrocious. Think of negotiating in a foreign language & not knowing what you signed. When the Indians started wising up to how untrustworthy white men were, they changed tactics & got the land by other creative methods, no less devious. Asking for mineral rights or right of ways then never giving anything back. This book was a book club selection & I have to say it was a very ambitious choice. Hardly anyone read the book although some members did watch the movie instead. Honestly, it would never be a book I would voluntarily choose to read ~ the ugly truth is difficult to look straight in the eye, especially when it's stripped bare and laid out as unambiguous & undeniable as it is in these pages. If we were in the same position today, I doubt we'd behave any differently tho. We'd probably buy into the same 'Manifest Destiny' belief that led to the demise of the Indians way of life as we did in the 1800's. It's sad too, because they lived on this continent for thousands of years & hardly left an imprint. 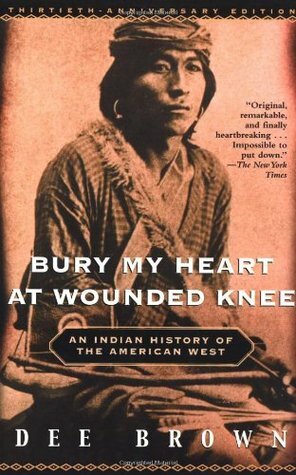 Dee Brown writes in the introduction, that Indians were a people who were true conservationists. They could not comprehend why the intruders were determined to destroy all that was Indian as well as America itself. Some of us find it perplexing still. 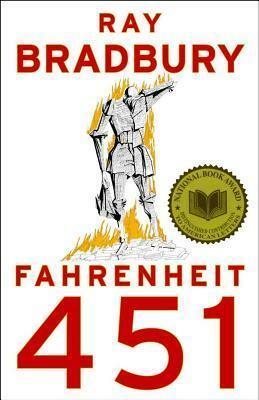 ** spoiler alert ** For a dystopian novel, this book is not entirely pessimistic. Unsettling. Disturbing. Profound. Yes. Yes. Yes. Remarkable in how applicable it is 65 yrs from its inception. Abso*freaking*lutely. Whenever I read a "classic" book, I feel compelled to look up the author to see if I can figure out where the visionary insight comes from ~ how did they pen words to paper that would live long into the future? That's when I saw that Ray Bradbury wrote 'Fahrenheit 451' in 1953 ~ during the height of the Cold War and "McCarthyism," ~ and also when he was only 33 yrs old! He had no idea then of the technological revolution looming in the future (that he would actually live to see since he just passed in 2012.) It makes you wonder how often his words came back to haunt him or how much he thought about them? I have to think it happened a LOT. Where he thought of mass media (newspapers, radio) brainwashing people, he couldn't have known how much more efficient our constant connectivity would be at accomplishing that very thing. It made me want to turn off my TV, subscribe to a newspaper, anything to keep my brain capable of critical thinking. The addiction to "parlor walls" frightfully reminiscent of the reality TV phenomenon, the blurred lines of what's real and what's made up, how easy it is to be caught up in other people's lives so we don't think about our own. Guy Montag's world is prophetic in the way it's concerned with not making anyone feel bad & how that corresponds with the political correctness of today. The really scary thing is that giving up books was voluntary (for the most part) with the masses not having time for them or the thoughts they evoke. As long as they kept occupied with "fun" and entertainment, they wouldn't actually engage in their own lives or the world around them. Remember when Guy escaped at the end and he's consumed with the sights and smells of the "real" world? They were so foreign to how he'd been living. It was sad to "see" human beings (capable of so much more) living like zombies and controlled (whether they were cognizant of it or not) by devices. Sounds eerily familiar, doesn't it? Explains why books, good journalism & disconnecting are as critical as ever in todays' world. I think I would prefer to be the woman who chose to be burned with her books than live in a world without them. The hope in 'Fahrenheit 451' (& why I wrote in the beginning that it wasn't entirely pessimistic) lies in the fact that as human beings, we keep repeating mistakes. Over and over and over again. But, so far, we keep getting opportunities to correct. The nuclear bomb at the end, another chance for a fresh start. Maybe someday we will actually learn from those mistakes, move past them and take the next step toward truly evolving as an intelligent society. As long as there are Guy Montag's in the world (and Fabers and all the others), the possibility looms eternal. I definitely want to hang onto that.